Testified in dispute involving a bank trustee, conflicts of interests and breaches of fiduciary duty. Testified in a dispute involving tortious interference of existing contracts, banks violating their common law duties and responsibilities and banks violating standards of safety and soundness. 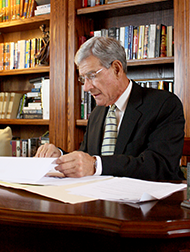 Cases involving the standard of care of a law firm handling an out of state merger transaction. Employment contract and reliance upon directives from the OCC. Provided jury trial testimony and opined that the seller of bank stock was not negligent and did not commit fraud in the sale of bank stock. Retained by the Resolution Trust Corporation as an expert witness on the ultimate issue of gross negligence in connection with two lawsuits against the Board of Directors of two large failed S&L’s in Texas. Provided an expert opinion as to whether the banks performed proper due diligence and adhered to accepted standards of credit analysis, policy and procedure. Retained in numerous cases to provide consultation and written reports involving branch banking operations, check clearing and funds availability.